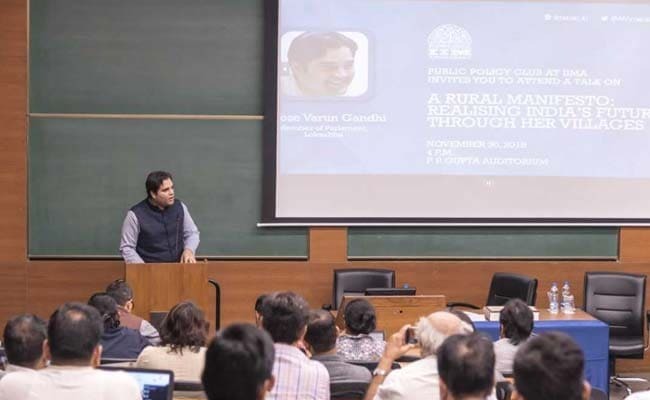 At the session in IIMA, he also released his new book ‘A Rural Manifesto: Realising India’s Future Through her Villages’. The talk was a peek into Mr Gandhi’s 2.5 years of research that goes behind the book, fondly referred to as ‘the unreadably dense volume’ by the author. He spoke in detail about possible political reforms that would help strengthen India’s democratic governance, such as parliamentary addressal of public petitions, need for addressing electoral corruption and strengthening the parliamentary discussion process on passing laws. “The premises that a change in the country’s systems and institutions is related to the way politics is run in this country was well brought out through a series of examples in modern day India. Mr. Gandhi stressed upon the fact that the future of the country is in the hands of young, bright minds and narrated incidents from all across India that suggested this,” Govil added.